Madfinger Games, the same guys that brought us Samurai II, just announced their new project called SHADOWGUN which is one of the first titles to be made specifically for NVIDIA’s new Kal-El quad-core processor. When you look up “console-quality” in a dictionary, the picture you are seeing above is now featured. Everyone please attempt to pick your jaw up from off the floor. The game is already being referenced as the “most advanced handheld game in the market” and will also have a version available for Tegra 2 devices. It involves futuristic weaponry, a personal Android assistant, bounty hunters, cyborgs, mutants, and genetically-enhanced humanoids in the year 2350. Do we even need to say more? Oh, a date. They are only announcing that game is in the works at this time, but hope to have it out some time in 2011. Be sure to check out the press release and some additional screenshots of the game after the break. This game looks amazing. 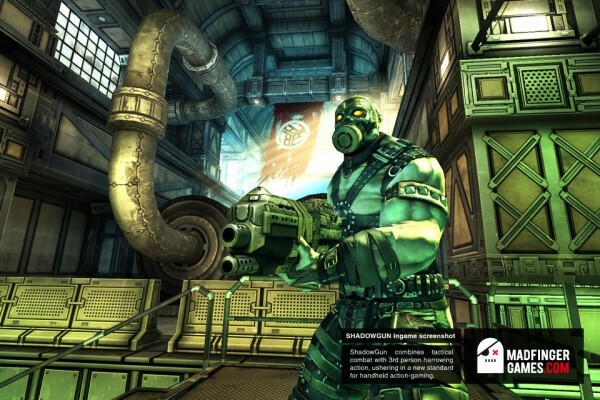 Brno, Czech Republic – 25th May, 2011 – Madfinger Games, creators of Samurai II: Vengeance, today announced the beginning of a new property SHADOWGUN, with an emphasis on next-gen graphics and immersive gameplay. 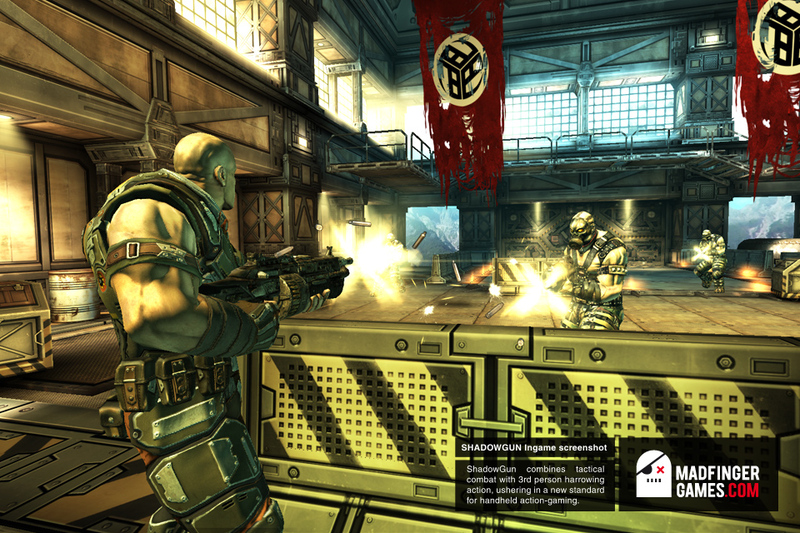 Authored with the Unity development platform, SHADOWGUN combines tactical combat with third person harrowing action, ushering in a new visual standard for handheld gaming. SHADOWGUNputs players into the role of John Slade, a professional bounty hunter in the year 2350. Slade’s mission: hunt down Dr. Edgar Simon, renowned geneticist and former employee of the trans-galactic corporation Toltech Enterprises. Players must lead “shadowgun” John Slade as he infiltrates Dr. Simon’s mountain fortress and fights his personal army of mutants, cyborgs, and genetically-enhanced humanoids. Using state-of-the-art weaponry, ships, and the assistance of S.A.R.A.—Slade’s personal android assistant. The story is written by award winning author Micah Nathan who has joined the MadFinger team as executive creative consultant for SHADOWGUN. Unity Technologies is revolutionizing the game industry with Unity, its award-winning breakthrough development platform. Unity Technologies has more than 500,000 registered users worldwide — including Bigpoint, Cartoon Network, Coca-Cola, Disney, Electronic Arts, LEGO, Microsoft, NASA, Nickelodeon, Ubisoft, Warner Bros., large and small studios, indies, students and hobbyists — all using Unity to create games and interactive 3D, like training simulations and medical and architectural visualizations, on the web, mobile, consoles and beyond. Unity Technologies is aggressively innovating to expand usability, power and platform reach along with its Asset Store digital content marketplace and Union game distribution service so that it can deliver on its vision of democratizing interactive 3D technology. Unity Technologies is headquartered in San Francisco and has development offices worldwide. For more information, visit: http://unity3d.com. Union is a newly formed business unit of Unity Technologies, dedicated to syndicating high quality video games to mobile phones, app stores, tablets, set-top boxes, connected TVs and other emerging platforms. Union works closely with Unity’s video game developers and publishers to build a portfolio of premium gaming titles. Union then adapts, localizes and syndicates this content to app stores, mobile phones and other platforms, as appropriate to the medium, helping developers access technically or commercially challenging monetization opportunities and providing platform partners with a rich gaming experience for their consumers. Union provides an 80 percent revenue share to its developers. For more information, visit: http://unity3d.com /union.